(CNN) -- Two bones and and a driver's license with Steve Fossett's name have been found near the site where Fossett's plane crashed in eastern California, authorities said Thursday. 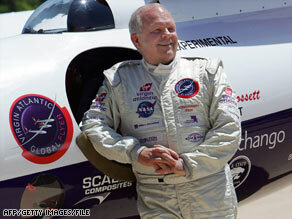 Adventurer Steve Fossett, shown here in 2006, disappeared after a solo flight in 2007. The bones appear to be human, and DNA testing will determine whether they belong to the adventurer, Madera County Sheriff John Anderson said at a news conference. But Anderson said he believes "our coroner's investigation is over and the Fossett family will finally have closure." "We talked to the family and advised them that we possibly, most likely, found the remains of J. Stephen Fossett," Anderson said. The site of Wednesday's discovery also is about a quarter-mile from where a hiker reported finding aviation identification cards with Fossett's name and $1,000 in cash in late September, Anderson said. Fossett was last seen on the morning of September 3, 2007, when he took off from the Flying-M Ranch outside Minden, Nevada. He was scouting locations for an attempt to break the land speed record in a rocket-propelled car. Animal chew marks were found on the driver's license and the shoes, Anderson said. He said the marks indicate that "animals possibly [moved] the body." Previous DNA tests on what were believed to be bone fragments at and near the crash site showed that the fragments weren't human remains, Anderson said. Before this week's discovery, Anderson said, officials could not be certain that Fossett was dead. "We could not categorically state that Steve Fossett perished in that crash because the only conclusive evidence our department had were those two aviation identification cards and $1,000 in cash," the sheriff said in a written statement. The National Transportation Safety Board has been investigating the wreck. Fossett made his money in the financial services industry but became renowned for his daredevil exploits. Fossett was the first person to circle the globe solo in a balloon, in 2002, and the first to fly a plane around the world solo without refueling three years later. He also set world records in round-the-world sailing and cross-country skiing.